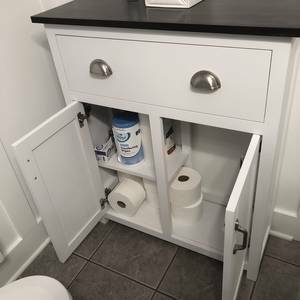 After shopping the past year for a cabinet for our bathroom, we couldn’t find anything that was the right depth, width or style for the small space. So we sketched out an idea that would mount to the wall and maximize its utility and aethstetic. I bought the Ryobi 10” table saw, 12” miter saw, 18v 6 gal wetvac for dust collection, orbital sander and went to town! Features inset doors and slow close drawer. Took about 16 hours over 2 weekends. All joints used wood glue and pocket holes screws. Primed and painted with Rustoleum spray paint with a stained top to match our mud room bench. To keep the profile thinn, the cabinet has 2 front legs and mounts directly to the studs in the wall. It also has a port on the wall-side and conceals the wall outlet which can be used to power anything that sits on top for decor! 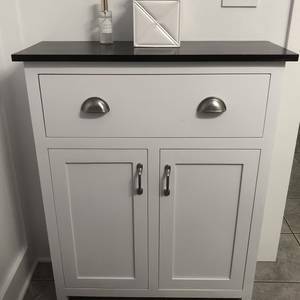 This was my first furniture project, and Ryobi made it possible! Great job on this piece! It looks so nice! After shopping the past year for a cabinet for our bathroom, we couldn’t find anything that was the right depth, width or style for the small space. So we sketched out an idea that would mount to the wall and maximize its utility and aethstetic. I bought the Ryobi 10” table saw, 12” miter saw, 18v 6 gal wetvac for dust collection, orbital sander and went to town! Features inset doors and slow close drawer. Took about 16 hours over 2 weekends. All joints used wood glue and pocket holes screws. Primed and painted with Rustoleum spray paint with a stained top to match our mud room bench. To keep the profile thinn, the cabinet has 2 front legs and mounts directly to the studs in the wall. It also has a port on the wall-side and conceals the wall outlet which can be used to power anything that sits on top for decor! 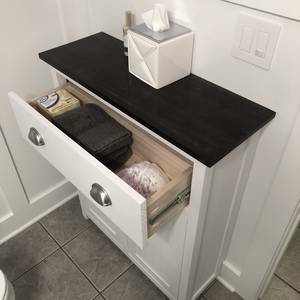 This was my first furniture project, and Ryobi made it possible!